By 1964, the civil rights movement had scored numerous victories through boycotts, student sit-ins, and mass marches. The state of Mississippi, seen as the “stronghold of segregation,” was the next testing ground. In Mississippi, activists faced an entrenched system of segregation and white supremacy upheld by both vigilante violence and state-sanctioned repression. Civil rights activists had been organizing in Mississippi for years, yet little had been achieved. In order to force a national response and focus attention on the brutal racism of Mississippi, a coalition of national and community groups, including the Student Nonviolent Coordinating Committee (SNCC), the National Association for the Advancement of Colored People (NAACP), and the Congress on Racial Equality (CORE), along with local community groups, organized the 1964 Summer Project. “Freedom Summer,” as it was known, brought over a thousand middle-class, mostly white college students from the north to work with Black community groups and movement activists in Mississippi. The focus of the project was twofold: first, an ambitious voter registration drive, and second, community organizing. The summer was enormously successful as a crucible for civil rights activists, and also marked a turning point for the militant wing of the movement. At the same time, Freedom Summer brought to national attention the lengths to which white supremacists would go to uphold segregation: before the project even started, three volunteers, one black (James Chaney) and two white (Michael H. Schwerner and Andrew Goodman), were murdered by a group of white police officers and vigilantes. Thousands more would be arrested and there would be scores of bombings, shootings, and beatings before the summer was over. The voter registration drive was the main focus of the project. When efforts to register Black people were largely unsuccessful, volunteers formed the Mississippi Freedom Democratic Party (MFDP), a racially nonexclusive grassroots party that aimed to challenge the official, all-white, segregationist Democratic Party delegation at the 1964 Democratic Party convention. When the MFDP was refused a seat at the convention, a debate began within the movement about the limits and possibilities of trying to reform the political establishment. 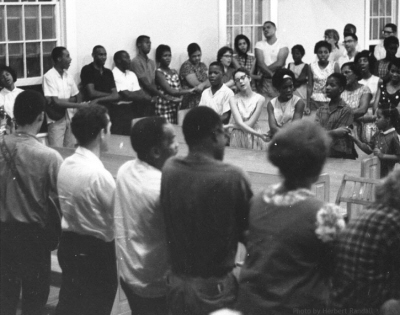 The second focus of Freedom Summer, and one of the most successful in community organizing and developing Black-led institutions, was the establishment of over 30 “freedom schools,” which used alternative and collaborative teaching techniques to provide classes on African American history, politics, and literacy free of charge to adults and children in Mississippi. Freedom Summer succeeded in bringing attention to racial oppression in Mississippi, and strengthened the resolve of movement activists to continue their struggle. Many of the volunteers, influenced by their work in Mississippi, went on to become leaders in the Black Power, New Left, and women’s movements of the 1960s. Most importantly, Freedom Summer marked a turning point for the developing civil rights movement, as the experiences of the MFDP, state repression, and the inability to fundamentally alter the situation for poor Blacks raised questions about the orientation, strategies, and tactics of the radicalizing movement.